Dawn in Lhasa is magical. From midnight to 7:30 AM silence sweeps across the growing city. The bars power down, the taxis stop honking, cars are parked, the streets empty of pedestrians, and the city sleeps. Lhasa is surrounded by high, protective mountains and the rising sun’s beams are blocked so that daylight creeps slowly before drenching the city in the heat of sunrays still intensely hot from their short commute to earth. The gray morning silence is broken only by the faint chanting of soldiers marching through their morning drills at the nearby military base. 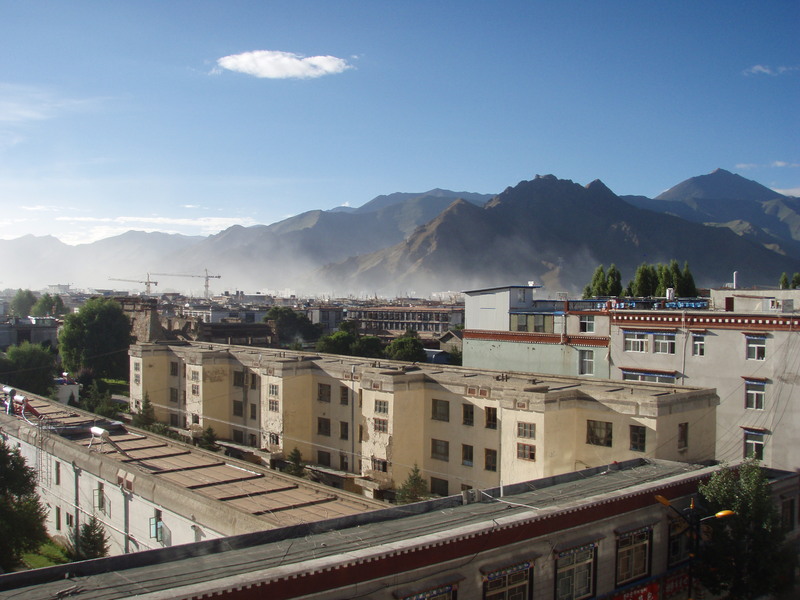 Smoke burns from thousands of altars in the temples of central Lhasa and engulfs the military bases. The government administration buildings, and the new hotels of Chinese Tibet. The pilgrims rise with the dawn. They have anticipated their visits for a long time. They march through the new, Chinese-built central plaza, converge upon Jokhur Temple, the holiest temple in Tibet, and begin their ritualistic circumambulation of the temple, called the kora. They walk around the temple clockwise and they spin prayer wheels clockwise because the wheels contain paper scrolls of mantras which must be read in the clockwise direction. As they spin their prayer wheels they repeatedly mutter the mantra Om mani padme hum. The pilgrims are dressed in the most unusual assortment of garments. The females wear pied aprons over long, black, sleeveless dresses. Their shoulders and arm are covered by bright shirts and their hair is woven with blue yarn and braided into pigtails. Their skin is dark, weathered, and wrinkled. Their faces are creased and their mouths are toothless. They wear jewelry of turquoise and coral, and, in my opinion, look more like Native Americans than Asians. The men wear a mismatched assortment of old-fashioned clothes – blue, feathered fedora hats, gray waistcoats, black jackets and brown slacks – as if the entire crowd is dressed from the emptied closets of the Rat Pack. They lean their weight on carved yak bone canes as they follow the lead of their grandsons through to the temple. As they approach the entrance, their rheumy eyes smile with the fulfilled expectations of someone who has walked to Lhasa from the most distant corners of Tibet. Before they begin the kora around the temple, they pass between two large columns covered in prayer flags and throw handfuls of barley into two massive furnaces that bellow thick aromatic smoke through the plaza and into the temple. Hundreds of small street vendors border the plaza and the pilgrims’ circuit that traces the perimeter of the Jokhor Temple. They sell prayer flags, prayer wheels, prayer beads, prayer mantras, incense sticks, necklaces, bracelets, copper jewelry polished to look like silver, tapestries, carved masks, Buddha statues, and almost everything else under the sky…save Free Tibet t-shirts. In front of the temple almost 100 devotees repeatedly prostrate themselves on the ground before the entrance. Tourists, both foreign and Chinese, gawk at the spectacle as they bow their heads, raise their hands in prayer, then lower themselves to their knees, and slide forward on their hands until they lie flat on their stomachs. They then raise their arms from the ground, stand up and repeat the movement again. So devout are the pilgrims that they must wear pads on their knees and gloves on their hands to protect their mortal bodies from as they repeat this ritual hundreds of times a day. The Chinese army asserts its presence over this atmosphere in an abrasively conspicuous manner, like that of a bossy older sister watching over her 17-year-old brother’s keg party, which she would not have been allowed to attend except that she took charge of the guestlist. Chinese soldiers stand in orange tents strategically places throughout the plaza so that in no place can you forget who is in charge. They stand on the rooftops of nearby buildings every day, watching over the temple entrance as if President Hu Jintao was delivering a speech on the futility of Tibetan independence from the roof of the temple. Though everyone else follows Tibetan etiquette and walks clockwise around Jokhur Temple, they soldiers walk shoulder to shoulder in the counterclockwise direction, against the grain. To top it off, attack helicopters circle the plaza inadvertently betraying Beijing’s sentiments – Religion! Self-Expression! Organization! Individualism! We fear these forces, for they shall be our downfall! Repression is the only solution! After paying the ridiculously high entrance fee (most of which goes to the government, not the Tibetans), you are allowed to pass into the temple. You must remove your hat and turn off your camera, though the Chinese police keep their hats on and their security cameras watch over every inch of the temple. Inside the temple the pilgrims continue their kora, moving clockwise from altar to altar in the same way they did outside. The room is dark, hot and smoky from burning incense and melting yak butter candles. The whole temple is redolent of yak butter, incense and barley. It is a scent that is uniquely Tibetan. Mao’s soldiers turned this temple into a pigsty during the Cultural Revolution – literally. They expelled the resident monks, renamed it Guesthouse Number Five and ordered monks to camp on its altars. Today, many Chinese are ashamed of this period of unspeakable desecration. The monks have returned and the temple has been reopened to pilgrims (but most importantly, to tourists). Though plain-clothed policemen stand conspicuously in the corners, the pilgrims seem pleased to have their temple back. They shuffle into the sanctum with big thermoses of liquid yak butter and fistfuls of yuan for donation. They duck into the dozen or so alters that radiate from the central Buddha and pray to Buddha and their uniquely Tibetan gods and “protector demons.” They pay their respects by pouring melted yak butter from their thermoses onto 2-foot-wide yak butter candles, then sliding a folded bill into the donation box and pressing their foreheads against the altar’s glass case. They repeat this process for each alter as tourist groups watch in awe. The pilgrims’ murmurings continue unabated, swelling with the quickening beat of a distant drum into a crescendo of mantras, and your head swells and your body floats and your lose all sense of where you are, who you are, and why you are here on Earth, until you are pulled back to your senses by the warn rays of light creeping in from the small ceiling windows and suddenly you remember where you are – in Jokhur Temple, the holiest of holies, in the center of the Rooftop of the World, in Lhasa, Tibet. And as you exit the temple, you smile as you realize that you just lost yourself in the irresistible spell that is Tibetan Buddhism.